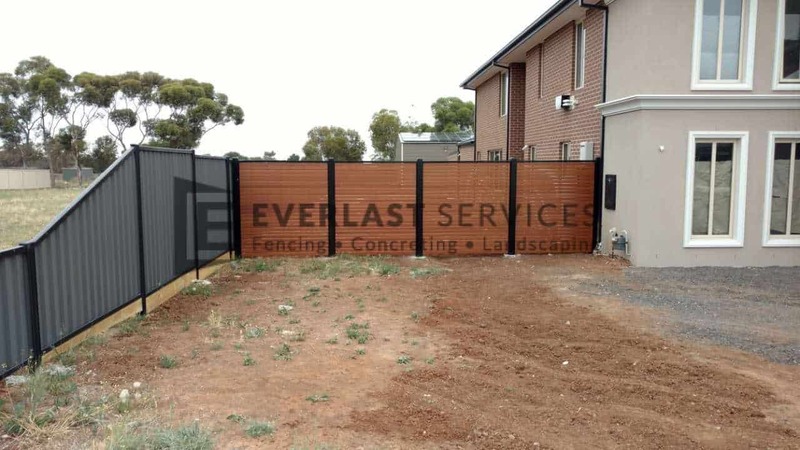 This job in Keilor Downs called upon all of our expertise and required an input from the whole team. We brought our usual passion, attention to detail and absolute respect and care for the wishes of the customer and ended up delivering exactly what we promised, on time and on budget. 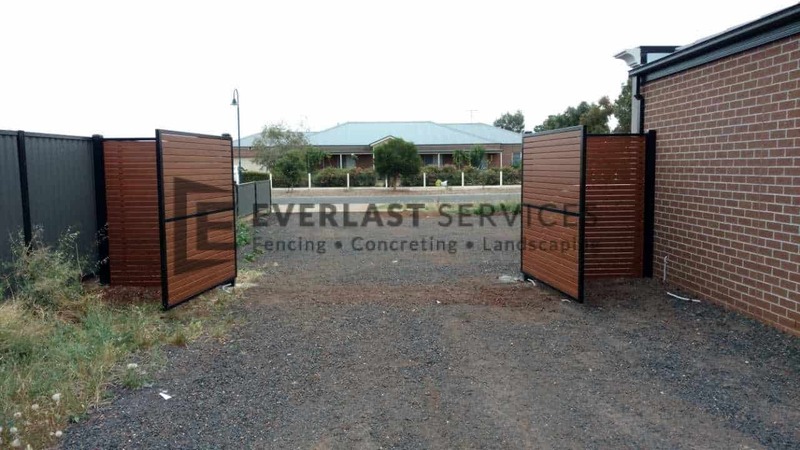 The customer wanted a stylish and easily-accessible entry point to their home and Everlast Services had the answer. The owners wanted something earthy and natural, but were turned off by the price of hardwood and didn’t want to settle for treated pine. Luckily, we were able to offer them the perfect halfway point. We showed them some samples of the Bush Cherry aluminum fence slats that we fabricate in our Hopper’s Crossing factory and they were blown away, to say the least. 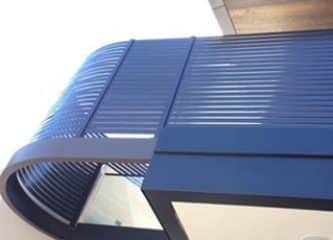 The slats looked exactly like the wood they wanted but were half the price. On top of that, we explained that they would last a lifetime and the only maintenance they required would be a hose down every now and then. That sounds a lot easier then getting the varnish out once a year, doesn’t it? We were able to provide them with the gate and fence at an unbelievable price, the customers jaw hit the floor when we passed on the quote. We were able to offer far less than our competitors because we could make all the products in our factory. We don’t have to pay the middleman, which allows us to find huge savings and pass these on. Our wonderfully talented fabrication team quickly set about creating the black steel frame and the aluminum slats. 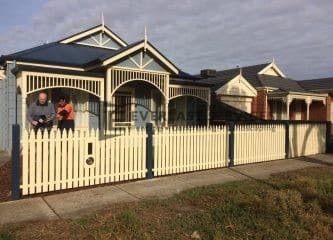 As soon as they were ready our installation team quickly set about constructing the fence, the owner’s couldn’t believe how quickly it went up and the quality of the workmanship. To top it all of, we added a motor to the gates, meaning that at the touch of a button the owners can gain entry to their driveway. We sourced the motor from one of our trusted partners, meaning we could vouch for its quality and get it at a far reduced price. We know the motor will cause them no problems and it was incredibly rewarding to watch them press the button for the first time and watch the gates swing open. 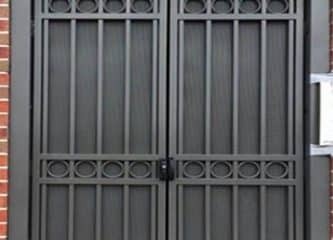 The automated gate and fence has added enormous value to the home and bumped up its curbside appeal. The house really stands out on the street and the set-up strikes the perfect balance between grandeur and the natural, earthy look that the client asked for at the beginning of the job. We’re so proud of the team and we are continually amazed at the quality of their output and their ability to consistently deliver on time and strike up a relationship with the customers during the project. We’re pleased to add this job to our portfolio and the owners are pleased to have an Everlast Services solution standing at the front of their house. Another happy customer and a great product delivered at unbelievable value.